With Pokémon Omega Ruby and Pokémon Alpha Sapphire releasing later this year, fans have already started excitedly speculating about all the third generation Pokémon that might get a mega evolution—and this is that we don't officially know if the remakes will have any. I'll have to agree with Metagross and Swampert—and to throw my own picks in here...well, I basically have two lists. My "watch the world burn" list includes Ludicolo (because he's a ridiculous party Pokemon), Slaking (because that would be hilarious), Nosepass, Wailord (plz make him even bigger), Spinda, and Luvdisc. My more serious picks would include Zangoose, Flygon, Milotic, Dusclops and Salamence (the common factor here being that they all look cool). 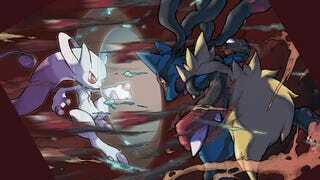 What about you, what Pokemon do you think should get mega evolutions in the remakes? And note that for those of you wondering if the legendaries on the covers are mega evolutions or not, Serebii reports that the Pokemon Company says they're "never before seen Pokémon"—so this could either mean a new forme, Mega Evolutions, or something else altogether. We'll see soon enough: the first footage of the remakes drops this Sunday on Pokémon Get☆TV.